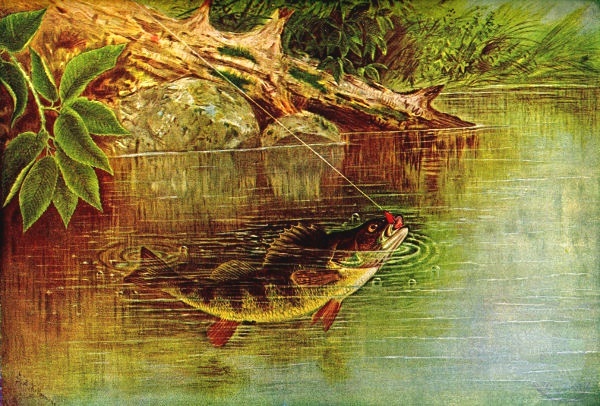 This yellow perch drawing was included in a wonderful full-color magazine from the late 1800s. It featured beautiful illustrations and some early photographs of nature. Birds and All Nature unfortunately did not identify the artists in their September, 1899 edition but since it was published before 1923, we can safely use it in our own creative projects. The yellow perch can be found in much of the world except extremely cold places like Iceland. Though the article did say they can be found in the Alps. Perch are known to be voracious eaters and are quite prolific. The good news is these colorful fish are considered a good and wholesome food. No skinning or scaling for us. Well, maybe some scaling if you want to change the size a bit but otherwise we get to enjoy everything lovely about this yellow perch drawing.